George Edward Bowes of Strathadam, NB passed away on December 4, 2018 at the Miramichi Regional Hospital at the age of 79. George was born on December 10, 1938 in Newcastle, NB to the late Edward and Margaret (Richardson) Bowes. George first embarked on a career in the Canadian Air Forces as an Air Traffic Controller. It was there that he met the love of his life, Elsie Bartko. After a brief courtship and engagement they married at Saint Mary’s Roman Catholic Church on October 25, 1961. They continued their life in the Air Forces until 1969, when George decided to become a teacher and he obtained his Bachelor of Education. Years later in 1989, George also obtained his Master Degree. George started teaching at the James M. Hill High School, but transferred to Harkins Middle School where he stayed until he retired in 1998. George worked with the Air Cadets Squadron 315 for 18 years as a Captain and Commanding Officer. George was an active member of the Knights of Columbus #4886 as a treasurer, bingo caller and cook for breakfasts. George was a member of the Legion # 10. George was a member of the Saint Mary’s Roman Catholic Church Senior Choir, where he often sang solo. George is survived by his wife of 57 years Elsie and their four children Brenda of Hamilton, ON, Thad (Lucy) of Winter Park Florida, Alex (Sue) of Toronto, ON, Belinda Shaddick (Darren) of Strathadam, NB., seven grandchildren: Jennifer Elgey (Spencer), Ashley and Cassidy Bowes, Jared and Owen Shaddick, Greta and Georgia Bowes, great grandson: Everett Elgey, three sisters: Mary Butler (Charlie), Peggy Phillips (Donnie) , Elva Bowes (Bobby Hare) all of Miramichi, NB, two brothers: Ned (Hillary) of Fredericton, NB, Reg of Miramichi, NB seven nieces and five nephews. Visitation will be held at Bell’s Funeral Home on Sunday December 9, 2018 from 2-4 PM and 7-9 PM. Mass of Christian Burial will be celebrated from Saint Mary’s Roman Catholic Church on Monday, December 10, 2018 at 10 AM with Father Antonio Reyes officiating. Burial will take place in Saint Mary’s Roman Catholic Church Cemetery later in the spring. In George’s memory a donation may be made to the Diabetic Association or Autism Resources Miramichi. Please note: Retired teachers are asked to present for assembly at Saint Mary's Roman Catholic Church, by 9:30 AM, Monday, December 10th to form honour guard. Please note: Knights of Columbus 3rd degree are asked to meet at the church at 9:30 AM to form honour guard. 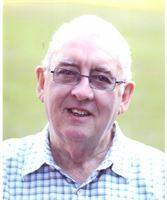 Messages of condolences can be made on our website at www.bellsmeadows.com. Funeral arrangements are under the care of Bell’s Funeral Home, 651 King George Highway, Miramichi, NB; Telephone: 622-3600.